Whether you’re looking for an efficient ride or a maneuverable vehicle, there’s a lot to like about driving a sedan in the West Valley, Murray City, and Orem areas. Popular models currently on the market are the VW Jetta and Subaru Impreza, but which is the better pick for drivers in our area? To figure it out, the team at Volkswagen SouthTowne compared the 2019 Volkswagen Jetta vs. Subaru Impreza, so that we could look at these sedans side-by-side to see what each has to offer. If you like to be in complete control of your driving experience, you’ll probably like that both the VW Jetta and Subaru Impreza come standard with a manual transmission. However, you may have a bit more control in the VW Jetta, which comes with a 6-speed manual transmission, compared to a 5-speed manual transmission in the Impreza. Both sedans also make an automatic transmission available for optimal performance and improved fuel economy. In fact, with the automatic transmission in the VW Jetta, you’ll manage an EPA-estimated fuel economy of 30 MPG city and 40 MPG highway.1 Comparatively, the continuously variable transmission in the Impreza gets you an EPA-estimated fuel economy of 28 MPG city and 38 MPG highway. The VW Jetta also allows you to further customize your ride by including a Driving Mode selector. This feature lets you choose between four different drive modes: Eco, Normal, Sport, and Custom. Unfortunately, this level of personalization is not available with the Subaru Impreza. If you like the idea of having a second set of eyes on the road, you’ll probably like the Collision Mitigation technologies available in both the VW Jetta and Subaru Impreza. Both sedans, for example, make a Blind Spot Monitoring system available. This system issues an alert when another car enters your side blind spot. A system like this can make merging much safer, whether you’re driving on the highway or in the city. They also both make automatic high beams available. This feature automatically toggles your high beams on and off to improve visibility. If an oncoming car is detected, your high beams will automatically dim. With this kind of a feature, you don’t have to worry about dimming your brights when driving on a dark street at night and can focus more on navigating the road ahead. While both sedans offer ways to potentially avoid a collision, the VW Jetta is the only one with a post-collision safety system in place. The Automatic Post-Collision Braking System automatically helps to slow the vehicle down after a collision to avoid any additional impacts or rollaways. With this feature, drivers in the VW Jetta may be less prone to roll through impacts immediately following a collision. 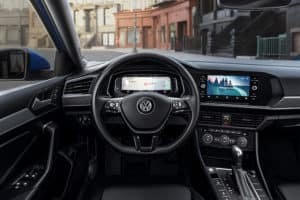 The team at Volkswagen SouthTowne compared the 2019 VW Jetta vs. Subaru Impreza on the points of safety technology and drivetrain, and found that the VW Jetta has more to offer drivers around the West Valley, Murray City, and Orem areas. If you want to get behind the wheel of our winner, visit our Volkswagen dealership and we’ll get you out for a test drive. 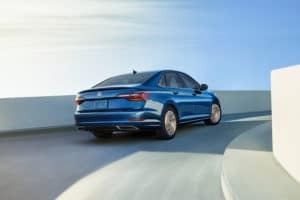 Contact us to test drive the 2019 Volkswagen Jetta today!